today we're kicking off reviews of the Christmas In Laylaland collection with Layla CE 53 Killing Red. 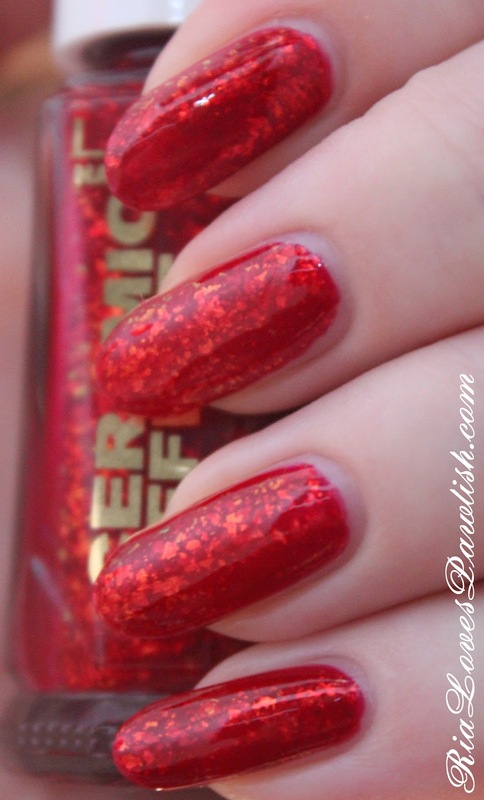 it is a gorgeous red jelly with golden flakies! this one will keep you staring at your nails, constantly moving them to see all the flakes. because it's a red jelly, the flakes often look red... i did manage to capture color in the photo, though! the formula is great... it only took two coats for full opacity. it does want to eat up topcoat, so you'll probably need at least two coats for that mirror shine. two coats Killing Red, two coats Seche Vite. there is a bit of green flash, but i really can't see it on the nail... it showed up in some photos and you can see it in the bottle, though.